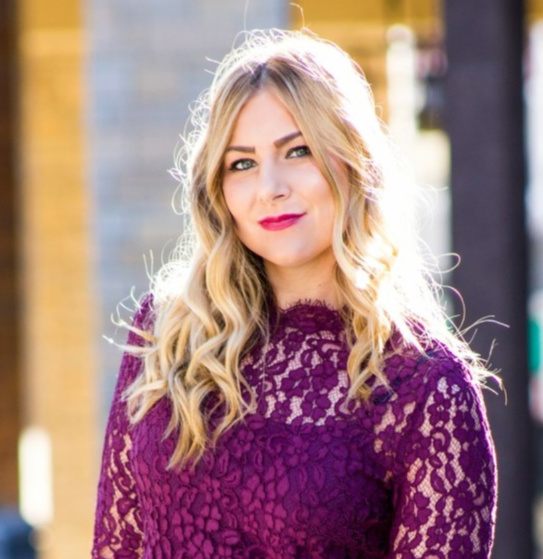 Well this is embarrassing you guys… not so much that it has been over a month since my last outfit post, but that just two outfit posts ago I was wearing this same sweater. I swear I have worn a lot of other things in between time, it just happened this way. AND hooray! It is Halloween week and I am absolutely pumped! Going to be a long, yet fun weekend. Four costumes, so little time. Have a great week! You look so lovely and serene, love these pics. 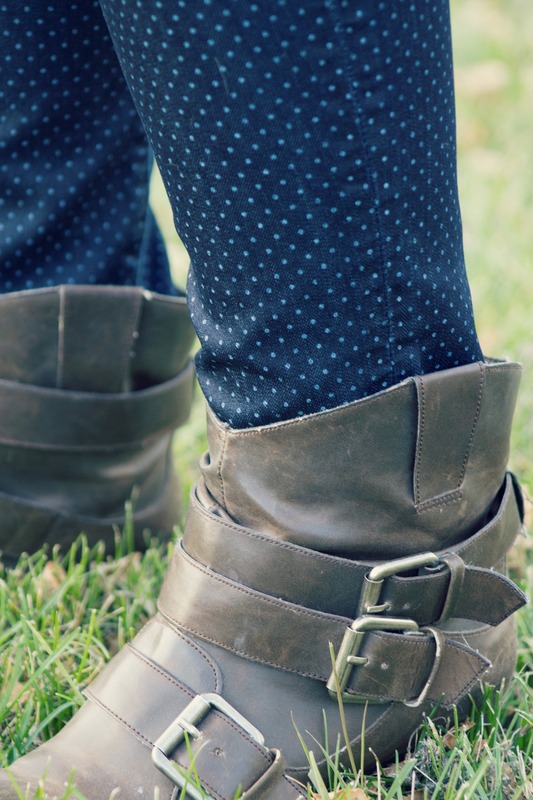 I love your ankle boots and polka dot jeans! Four Halloween costumes? I can’t wait to see! You look so gorgeous! Love those boots! And I can’t wait to see your Halloween costumes. Sounds like you’re going to be a busy lady this week! Yay! Another outfit post! You look adorable–and is it just me, or is your hair blonder? Haha, NOPE actually it isn’t! I think it is just the lighting or editing or maybe wearing my hair in a ponytail! I am getting it fully foiled soon though 🙂 so it will be more blonde then! 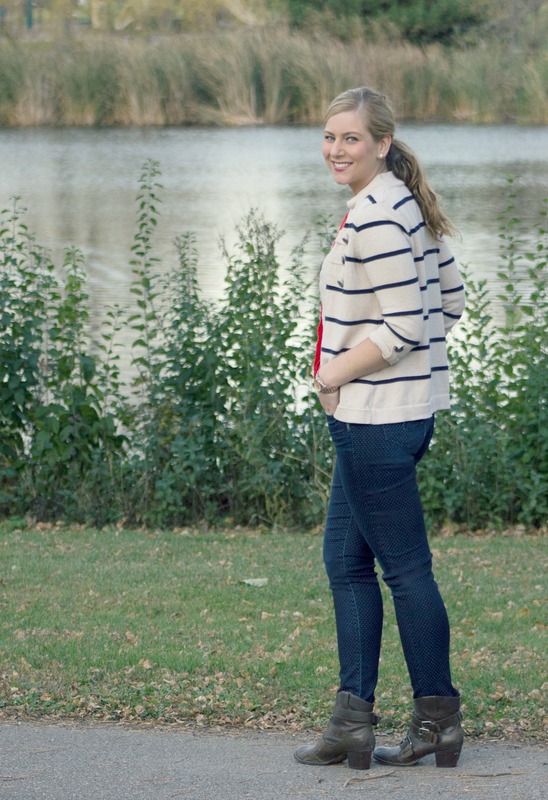 This cardigan is pretty much my favorite thing of yours and this outfit is perfection too! Absolutely no embarrassment or shame in having an item appear in consecutive outfits! I do that all of the time. Plus that cardigan is gorgeous and totally deserves to be shown off! Four costumes for Halloween? Color me intrigued! I really like this look – I have a striped top that I might have to pair with orange sometime, I like the combo! I love that cardigan! You look great! I love this look and remember seeing it as an ootd on Instagram! The subtle print-mixing is great, and I love the pop of color (which really stands out in a sea of fall neutrals everywhere)! Thank you Jacy! 🙂 And yes, one of my Insta #ootds 😉 I didn’t think we would be taking pictures to share on the blog, but it ended up that way which is good! Need to start taking more outfit photos again! This is such a perfect Fall look! Love the color of that top! Welcome back! Those polka dot jeans are adorable! Love all these pieces together. 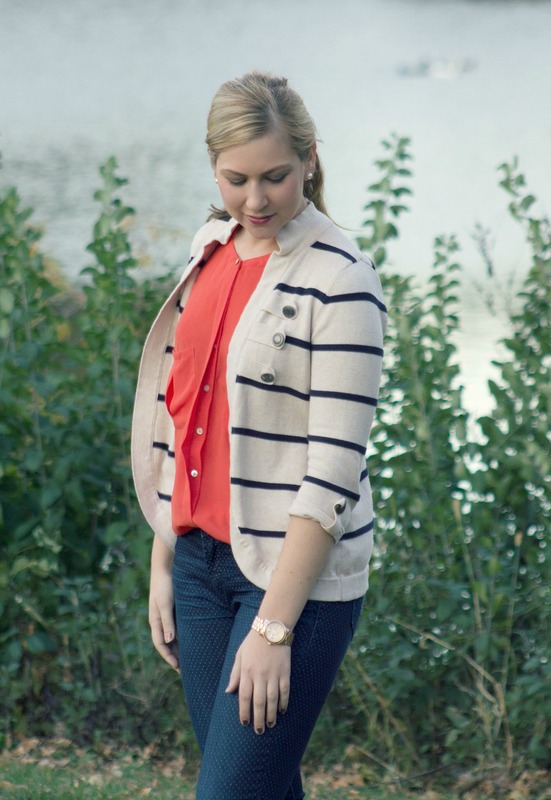 I have an orange blouse that I paired with dark jeans for a post this week but I love how you added a blazer. Definitely going to try that the next time I wear it. I love this whole look! including the polkadotted pants! You look so cute! I love those jeans. Ever since I started taking outfit pictures I’v enoticed that I rewear the same pieces over and over again. You cant help what you love! love the mix of polka dots and stripes! the background is gorgeous. and wow,4 costumes – i’m wearing the same one to all 3 of my halloween events, haha! You wear that sweater as much as you want! It’s adorable and so are you! Can’t wait to see your costumes this week!! I am drooling over your striped sweater I love it with the orange/coral shirt underneath. This is such a pretty fall look. The coloring of these photos is gorgeous! haha, I have felt the same way lately. I’m feeling good if I post twice a week with all the traveling I’ve been doing for work. Did you change your URL recently? You disappeared from my Bloglovin’ roll, but I have you back now, phew! I love this whole look, and you are fabulous with lighter locks! 4 costumes?? What?!! You better post pics of all of them!! I still love this striped sweater Rachel! I loved this sweater last time you wore it and I love it again now. Looks so good with these jeans! loving those polka dot pants. adorable. Very cute outfit and I love your ankle boots! I’ve been looking for a similar pair. Heading over to the link you shared to check them out now. I love this casual chic look! It’s stunning! Oh honey, there’s no shame in a period of uniform-dressing. Life happens! 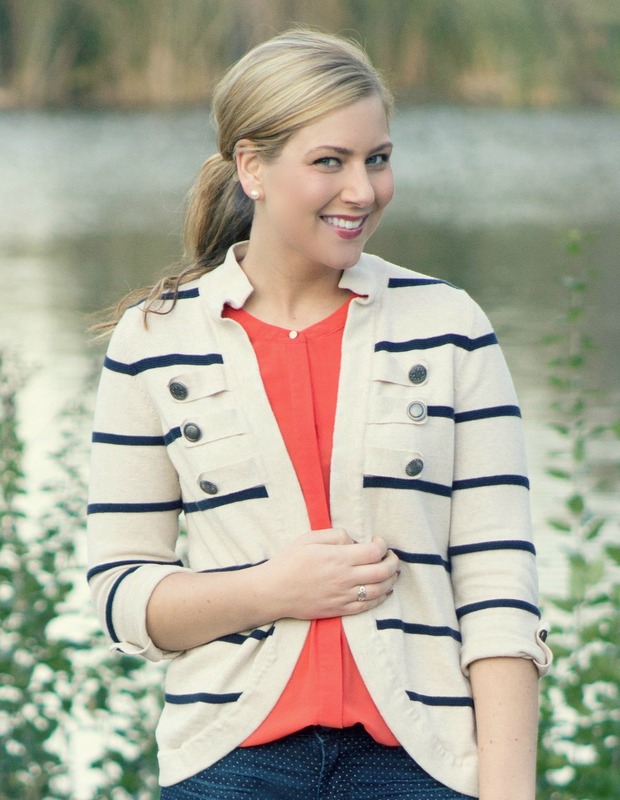 But anyway, the striped cardi is super cute! No shame in stripes ever. 🙂 You look adorable! If you were wearing anything else, I might be embarrassing, but this sweater is awesome! I’m so in love with it and it looks fantastic with the orange and the polka dot pants! That is a great cardigan. It's classic, but has so many fantastic details! Lurv it! Love that cardigan!! This is such a cute outfit, love it! Well, that is a really cute sweater, and should get worn and blogged frequently! ohh I love the cardigan and your outfit is adorable! I love cardigans and this one is so beautiful. Hey Rach! Thanks for stopping by the blog. Lucky Fabb was so fun and lots of great information. We should def go together next time. I think bloggers conferences are a must.. Have a great day, Rach! xo! I’m glad you got a lot of great information. 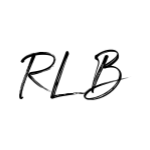 I haven’t been to a blogging conference and starting to realize it is a must! Love the striped cardigan, you look so pretty! EEEEk! I love this cardigan! Yay! A new outfit! That cardigan is so cute, and I LOVE it with that blouse. And the polka dot jeans? Adorbs.